Amidst all the hullabaloo about Army 2020 Refine and Multi Domain Battle, the British Army has quietly released a new iteration of its capstone doctrine – Land Operations. Doctrine is not everyone’s cup of tea, but it is important. 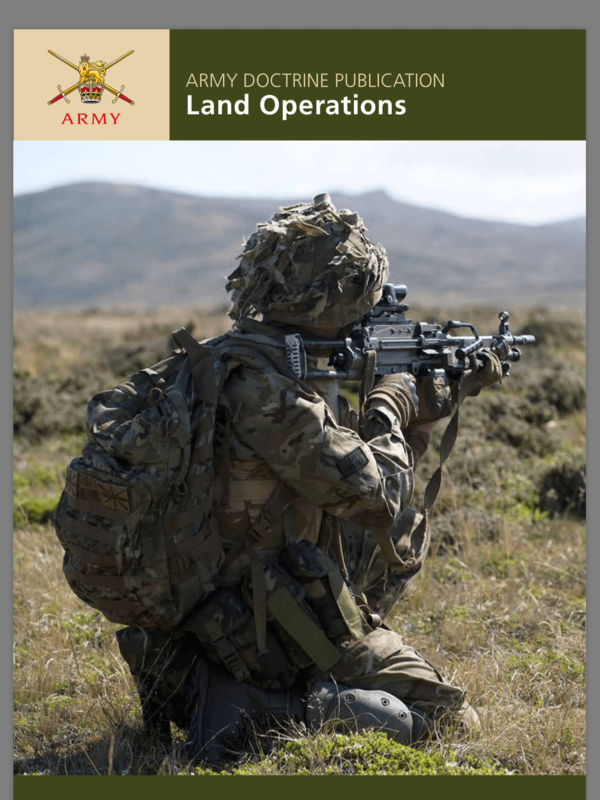 Land Operations clearly and concisely states what the Army thinks the nature and character of conflict is, the role of the army in conflict and how it will operate; it deserves to be scrutinised and debated widely. The experience of Afghanistan is writ large in this new doctrine, but there is a danger that in applying the wrong lessons of the last war we fail to position ourselves for the next war. This doctrine fully incorporates Integrated Action which I have posted on previously, but as well as Integrated Action, Defence Capacity Building and Cyber Warfare are incorporated to varying extents and there is a welcome new annex “Understanding Risk”. In providing extracts of this new doctrine I have focused mostly on those elements that look at what conflict is and our role in it. I have done so because these are the fundamentals around which we build our functions, structures and equipment, aspects which are much debated in this forum. The land environment has human, information and physical aspects. Most people live in towns, cities and villages, and increasingly in coastal regions. There are very few areas in which no people live; even then, most apparently unpopulated space is a resource that supports the population in some way. People exist in linguistic, cultural, social, and political groups with specific identities, usually associated with particular territories. These territories typically take the form of states, or regions within or between them. The significance of territory is, therefore, associated with group identity and access to resources; it is often rooted in deep cultural and historical factors as well as in governments’ obligations to provide security for their people. Competition for territory and resources, and issues such as injustice and lack of representation are often at the root of conflict. Because of its significance, the physical capture and occupation of territory, or the credible threat to do so, has often been regarded as decisive. But, the ultimate decision is political rather than physical; people have to decide whether or not to accept the facts on the ground. Land forces, by dint of their presence among and proximity to the people, provide an important and usually necessary contribution to achieving these political outcomes. The land environment is also shaped by the way that information is exchanged between individuals, tribes, ethnic and interest groups, and countries. This communication can be verbal, directly between people, through radio, television, and online. Human interaction is expanding and accelerating as information flows in the virtual domain increase. In the new information landscape, any digitally connected person has the ability to shape public understanding of and consensus for (or against) a conflict, or be influenced by other actors who exploit these means. Land Power Definition. The ability to exert control within the land environment and to influence the behavior of actors and the course of events. All land forces, regular or irregular, have four inherent attributes. Each attribute has advantages that can be used, but also disadvantages that have to be avoided or mitigated. a. The primary attribute of any land force is its people. Land conflict is a human activity, between individuals and groups of individuals. Each of these participants has their own perceptions and interpretations of the environment. Land forces, therefore, are complex organisations, requiring moral as well as structural cohesion and deep hierarchies of command. They can be difficult to direct, so decentralised command systems tend to work best. Large numbers of people can also be expensive and lead to competition with other sectors of society requiring skilled personnel. Land forces are particularly reliant on high quality leadership, education and training at all levels. to which they are uniquely vulnerable. Sometimes this threat is mitigated by small or discreet deployments that contribute out of proportion to their size. To operate effectively, land forces must be able to understand and cooperate with local actors. c. The attribute of persistence, the capacity of land forces to extend their presence in an area for long periods of time, gives land forces the potential to deepen their understanding of the local context, and develop engagement, control and influence. Presence and persistence can be highly significant, if matched by political commitment. d. Land forces have inherent versatility because they consist largely of organized groups that can relatively easily conduct a very wide range of military and non-military tasks. So even when optimised for warfighting, land forces can be adapted to support, for example, stability and non-conflict activities such as humanitarian assistance and disaster relief. • evolving strategies and tactics. Rapid and broad communication of messages and ideas flow across physical boundaries through the virtual domain, energising the causes for which people fight. Adversaries can develop and exploit recruitment, manipulation, mobilization and targeting opportunities, while promoting their own narratives of events, in competition with our own. Our adversaries can share information and adapt more quickly than in the past. Because of the proliferation of information, military activity is often immediately visible to a local and global audience. The local audience includes enemies, adversaries and a range of actors, from allies and partners to the local population. The global audience is unbounded. Each of these groups interprets our activity through their own lens, and each is influenced by others. Many actors are adept at presenting military activity to the audience, magnifying, mitigating or altering it to influence observers’ understanding of what actually happened. This is critically important to us, our allies and adversaries, because the audience judges whether military action achieves its political objectives. The impact of physical military activity can have more immediate, wide-ranging consequences than in the past, for example more quickly deterring, demoralising or stiffening the resolve of other actors. As we and other actors become more and more reliant on sophisticated information services, so the threat of cyber attack increases. This novel threat has the potential to disrupt our information services and any systems that rely on electronic control systems. As our military operations become more visible, and come under greater domestic and international scrutiny and criticism, there is a higher expectation of military restraint compared with the past. This often leads to legal and policy constraints on our use of force additional to the requirements of international law. Many of our actual and potential adversaries do not recognise international law, and do not have the same constraints. They are able to exploit this situation to their advantage by, for example, concealing themselves in the population, using tactics and weapons not available to us, or causing us to be restricted by our own (legitimate) rules. The power of physical weapons continues to increase, and these weapons are often available to irregular forces. Chemical weapons are used and biological, nuclear and radiological weapons remain a threat. Fires and explosives continue to dominate and shape the tactical battlespace, whether, for example, delivered by long range rocket systems or in the form of improvised explosive devices. These are what destroy things and kill and injure people; therefore they have the greatest resonance in the eyes of the participants and observers of conflict. The recent period has seen the emergence of the concept of ‘hybrid warfare’. This describes strategies that are not new, but which are increasingly employed by state and non-state actors. Potential adversaries are demonstrating the will and capability to undermine Western operational capability, resolve and legitimacy by blending conventional and unconventional forms of conflict, using both attributable and nonattributable methods. These include posturing, provocation and persuasion in the physical and virtual domains, subversion, and economic and cyber warfare, with or without the employment of conventional military forces. This ‘hybrid’ threat to the international rules-based order can be applied in a way that remains below formal Western military response thresholds. Land forces have four functions: fight, engage, secure and support. These functions of land power can be exercised independently or in combinations. a. The fundamental capability of land forces is to fight in the most demanding circumstances. This capability underpins the other three functions; gives credibility to deterrence, coercion and containment and other strategies; and is essential for interventions and territorial defence. b. Land forces can engage with a range of actors and audiences, directly and indirectly, contributing to understanding, influence and conflict prevention. c. Land forces are particularly able to secure and protect people and places persistently in the land environment. This includes providing security in support of inter-agency stabilisation and reconstruction. d. Land forces can support and assist state and non-state institutions. They can provide mass and presence as well as specialist capabilities. As the audience’s judgement is an increasingly significant factor in contemporary conflict, operations must be designed and conducted accordingly. No conflict has a purely military solution, and overall success requires favourable consensus among a diverse audience. What we say, how we are seen and what we do must be consistent and appropriate. At the margin, a neutral or nearly neutral outcome of military action can be turned into a success or a failure by how it is perceived. Because military force is used to achieve political outcomes, it should be consciously aimed at altering people’s behaviour. The application and threat of force, and the gaining and retention of physical objectives should be used to affect people’s decision making in ways consistent with our goals. For this reason, in combat, physical destruction and damage is used to achieve two things: an immediate local reduction in enemy capability; and more importantly, wider damage to the enemy’s will and cohesion. The most efficient and often most effective way to achieve this is by creating and attacking weaknesses to demoralise and disintegrate the enemy, rather than attacking strength head-on to destroy as much equipment, manpower and materiel as possible. As well as fighting and providing security, land forces are in a position to communicate directly with individuals and groups involved in a conflict. To change or maintain the behaviour of these actors, land forces should integrate the use of force with communications in a mutually reinforcing way. In turn, to achieve political outcomes, they must integrate their activity with that of the diplomatic and economic instruments of power. The relative ease with which our activities can be observed, commented on and interpreted by multiple audiences makes previous operational and nonoperational distinctions less valid. Even relatively minor armed conflicts have potentially global consequences, for example through diaspora of people with common identities or transnational economic dependencies. Since the effects of even distant conflicts have consequences domestically and for the international rules-based order, there is a strategic imperative for land forces to contribute to improved security in relevant parts of the world. Military power, complementary to other instruments of state power, can contribute through early and persistent engagement overseas, capacity building of local security forces, and by deterrence. In doing so, land forces can develop the understanding, relationships and outlook necessary should conflict occur. Integrated Action is the application of the full range of lethal and non-lethal capabilities to change and maintain the understanding and behaviour of audiences to achieve a successful outcome. Integrated Action describes how land forces orchestrate and execute operations in an interconnected world, where the consequences of military action are judged by an audience that extends from immediate participants to distant observers. Integrated Action requires commanders and staff to be clear about the outcome that they are seeking and to analyse the audience relevant to the attainment of their objectives. They then identify the effects that they wish to impart on that audience to achieve the outcome, and what capabilities and actions are available. These lethal and non-lethal capabilities may belong to the land force itself, or to joint, intergovernmental, inter-agency, non-governmental, private sector and multinational actors involved in the operation. What is important is for commanders and staff to work out how to synchronise and orchestrate all the relevant levers to impart effects onto the audience to achieve the outcome. Integrated Action, with the audience as its major consideration, requires sophisticated understanding, integration of all capabilities available, and is outcome-focused. These are the four fundamentals of the doctrine. a. People are at the heart of conflict; it is their decisions and behaviours that determine how conflict is conducted and resolved. Integrated Action requires consideration of the diverse audience that is relevant to the attainment of our objectives, globally, nationally and within theatres of operations. b. Integrated Action is founded on the land force’s understanding of its task and environment. A dynamic approach to understanding, built on a learning culture, allows the force to adapt and innovate in response to evolving situations. c. Land forces create desired effects by the integration of lethal and non-lethal capabilities. Effective integration relies on the cooperation and interoperability of the land force, multinational, host nation, inter-governmental, non-governmental and inter-agency partners, as well as of tactical combined arms formations and units. d. Integrated Action needs commanders to think about how their actions contribute to the desired outcomes, in a broad and evolving context. This approach encourages a wider and longer-term view of a situation, relative to the task and role of the land force. The doctrine of Integrated Action applies at all levels to land forces, from the land component of the joint operation, to tactical formations, units and sub-units. There is, however, an important delineation between responsibilities for its orchestration and execution. It is only at the higher tactical or operational level (usually the division or corps) that Integrated Action can be orchestrated and fully aligned with joint, interagency and multinational operations. In certain circumstances, brigades or units may be the highest level of UK land command in a particular theatre and so may be required to operate at the operational level. Examples include conducting capacity building or non-combatant evacuation operations. In such cases, they must be resourced appropriately. Integrated Action blends lethal and non-lethal actions to have effects on the understanding, physical capability, will and cohesion of the audience. Organised into attainable objectives, these effects are ultimately realised in people’s minds, influencing their decision making, to achieve the desired outcomes. Although not all tactical activities are directed against people, the ultimate targets of land power are the audience and actors. Integrated Action is planned from desired outcome back to actions, through objectives and effects, and adjusted in execution in response to what has been learned and the changing situation. Within the land force, the tactical functions are the primary levers of influence, representing the full breadth of the force’s activities that are integrated when orchestrating and executing operations. These are, however, rarely sufficient. Commanders and staff must also seek to integrate a range of different levers not under their direct control; they must, therefore, cooperate with joint, intergovernmental, inter-agency, non-governmental, private sector and multinational actors involved in the operation. Those tactical functions mainly directed towards actors are: manoeuvre, fires, information activities and capacity building. Their successful application depends on command and intelligence which set the operation’s direction, and protection and sustainment which enable the mission. These tactical functions can also have direct and indirect effects on the audience as well as on the mission itself. For example, how a force collects intelligence, protects or sustains itself may directly affect the audience’s perceptions of the force. The tactical functions are a device that helps to organise activities into intelligible groups; they have no effects, whereas the activities do. As a rule of thumb, corps and divisions are designed to conduct all the tactical functions simultaneously. Subordinate force elements may be able to apply all the functions to lesser degrees or specific ones to great effect. The tactical functions also provide a useful checklist for commanders when assessing a plan, and a common vocabulary for describing a force’s overall capabilities. British Army doctrine follows the NATO codification of operations themes, types of operation and tactical activities. This enhances interoperability with allies and aids understanding of the mosaic of conflict. Operations may be assigned or described in terms of particular contextual themes. 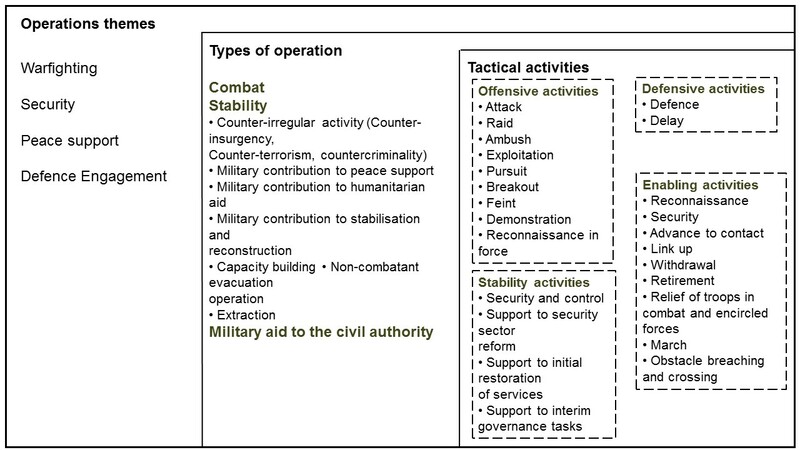 These operations themes allow the general conditions of the operating environment to be understood, informing the intellectual approach, resources available (including force levels, rules of engagement and force protection measures), likely activities required and levels of political appetite and risk. There are four themes, aligned to the functions of land power: warfighting, security, peace support and defence engagement. These themes provide a framework for understanding in general terms the context and dynamics of a conflict and are often concurrent with other types of operation within the mosaic of conflict. These aid analysis and articulation of complex missions and provide the essential gearing required to sequence a series of tactical activities to achieve operational objectives. Within all types of operation, land forces conduct all or some of a range of tactical activities, often concurrently. This is an evolution of British Army doctrine. It represents thinking borne of experience of recent conflicts, and in many of the terms and taxonomies it nests comfortably with NATO and US doctrine. Fundamentally this doctrine states what we think conflict is now and in the future, our role in it and how we do what we do. As we look at the experience of Iraq, Afghanistan, Syria and Ukraine, of the Russian role in the US elections and waning Western hegemony, have we got it right? My personal sense is that this new iteration is a good update and improvement. It is written in plain English, is concise (some 200 pages) and does largely reflect what I see in the changing character of operations. I do query whether if, by focusing our role as primarily about changing behavior, our doctrine may have become too obtuse for what is an army that will operate almost exclusively at the tactical level. I also query how often we need to update our capstone doctrine (previous iterations were issued in 2005 and 2010, and whether we are doing enough to educate and inform the wider UK defence community in our thinking. Read, think, question and debate!